Oldest Dance Music Institution in Delhi, it has been imparting training to the young aspirants. The Institution was founded in 1943 in Delhi and was registered in 1955 under Socities Registration act of 1860. It is one of the oldest Dance Music Institution in Delhi since then, has been imparting training to the young aspirants. Initially located in Bengali Market, Its present building, located at East of Kailash, came up in 1975 under the stewardship of its present Director, Uma Sharma (recipient of Padma Bhushan, Padma Shree, Sangeet Natak Akadami and Sahitya Kala Parishad awards) who has been its guiding spirit since sixties. 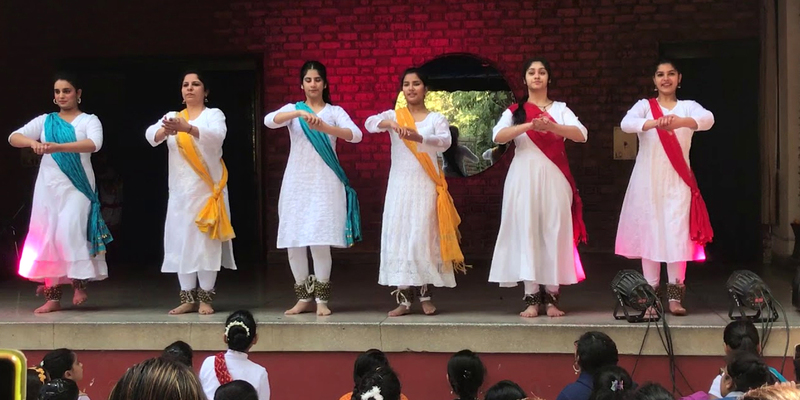 Since then, besides holding classes in Dance, Music & Painting, Bhartiya Sangeet Sadan has trained mainly students by teaching them Classical Music, Dance (Abhinay Facial Expression), Thumri-Bhav and also Painting & Sanskrit shlokas, vandanas under the guidance of Uma Sharma. Bhartiya Sangeet Sadan has also organized various concerts Music & Dance Festivals featuring eminent Artists. Some notable participants were, Ustad Ali Akbar Khan, Ustad Vilayat Khan, Smt. Siddheshwari Devi, Ustad Amajad Ali Khan, Pt. Hari Prasad Chaurasia, Smt. Yamini Krishnamurty, Ustad Zakir Hussain, Smt. Sonal Mansingh, Smt. Sitara Devi, Ustad Halim Jafar, Smt. Naina Devi, Smt. Parveen Sultana, Ustad Ashish Khan, Ustad Fahimuddin Dagar, Smt. Girija Devi, Ustad Asad Ali Khan, Pt. Shiv Kumar Sharma, Pt. Vishwamohan Bhatt etc. Sadan also has been organizing number of performances in aid of various relief funds. The school has been teaching number of overseas students from China, Japan, South Africa, Germany, Guyana, Brazil & other western countries. The institution has been organizing a number of Dance & Music concerts every year on regular basis – these include Swami Haridas-Tansen Sangeet & Nritya Mahotsav, Sharad otsav – Maha Raas Leela, Holi, Basant-Panchmi and Janamashtmi festivals. The endeavour is to present eminent artists so that the cultural heritage of India is kept alive. The emphasis is also on grooming young aspiring artists & present them on stage to awaken the classical dance & music heritage among the youth.